In conjunction with their upcoming tribute to Serge Diaghilev,* founder of the Ballets Russes, London’s Victoria and Albert Museum will launch Diaghilev, a limited edition fragrance. Diaghilev was designed by Roja Dove, who noted that "Diaghilev loved scent so much that when he traveled, the drapes always had to be scented". The notes for the floriental perfume include bergamot, rose de mai, oakmoss and vetiver. Diaghilev will be available in 100 ml Eau de Parfum, £75, and 1000 bottles will be produced. It will be sold at the Victoria & Albert and at the Roja Dove Haute Parfumerie at Harrods starting in September. * The exhibit Diaghilev and the Golden Age of the Ballets Russes 1909-1929 will open on 25 September. I’d want it for the Ballets Russes connection alone– and the presentation– but there’d have to be a total decant to get it away from that leaky squeeze-bulb atomizer. Wish I could be in London for the exhibition, too. I would love to see the exhibit! Wonder if it will travel, I’ll have to check. Oh my goodness! Yes! A must try! I recall the legend that Diaghilev loved Mitsuoko so much he’d spray the theatre curtains with it. I used to wear Apres L’Ondee to the ballet because my Guerlain SA (a very knowledgeable Swiss woman back in the ’90s) told me that Nijinsky loved it so much he would gift ballerinas in the Ballets Russes with it. Surely Mr. D- would create something very special for (the other) Mr. D…. I love the idea of misting the curtains with Mitsouko. If it wasn’t wasting precious pre-reformulation Mitsy I would probably do the same thing. I. Am. There. I had no idea this was coming up at the V&A so I am thrilled! Also, my birthday is in September so I think I can totally justify a bottle as a gift to myself/ memento of the exhibition. I’d never heard the Mitsouko legend, though. There, you’ve found your b-day present already! This sounds as though it could really be lovely. And the exhibit! Maybe it will come to New York…. Oh, I’d love to see this exhibit. There seems to be a strong connection between dancers/musicians and composers and fragrance… I wonder if there’s some kind of artisitc connection? Well, you know we refer to the “notes” of a fragrance, and that perfumers workstation was traditionally referred to as an organ. I suppose that people, such as musicians, who are especially attuned to one sense may also have a heightened appreciation of the other senses as well. Well, according to the lore at AG, that’s how Annick Goutal began “composing” fragrances. Oh, I wanted to add–I am glad this is being offered at a reasonable price (~$115 for 100 ml ), unlike SOME limited editions. If this is available online I’m all over it. I love Diaghilev, and Stravinsky is my favorite composer! Rite of Spring all the way. Oh, I wish this had been around when I was searching for my Monday Mailbag scent! (I had asked for recommendations while I was in London this past Christmas). Roja Dove? V & A? Ballets Russes? This would have been a very exciting try! Although the notes don’t sound terribly good for me–I’m not crazy about bergamot or oakmoss, so maybe I’m not missing anything . . . . Or maybe I need to go back to London next Christmas? 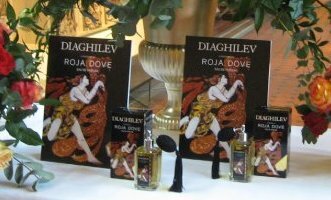 Just to say that i was in the Roja Dove store in Harrods today & Diaghilev was on sale – the original posting said it was not due out until September so if it is limited to 1000 bottles you might not want to wait that long! i liked it a lot – did remind me of Mitsouko! Glad to hear it’s like Mitsouko, as it ought to be. haha i agree, i guess not many people will stumble across the bottles in Roja Doves eyrie at the top of Harrods, but when its stacked up in the V&A shop i’m sure many of the hordes visiting the exhibition may be tempted. It was £75 for 100ml which wasn’t too exorbitant for a ltd edition & even made me get my wallet out! Kudos also to the the assistant in the Roja Dove Perfumerie who was really helpful & suggested & gave me a sniff around lots of the other fragrances i normally wouldn’t even have thought about – they all seem to know their stuff very well & love fragrance!